Published in the South Kent Gazette, 8 August, 1979. In connection with the very old established public house in Stembrook called “The Ancient Druids,“ it is of interest to recall that when war in India, at the beginning of the year 1846, necessitated ballotting for the Kent Militia, working men’s clubs to provide funds to pay for substitutes were formed throughout the county, and one for Dover was held at "The Ancient Druids,“ Stembrook. 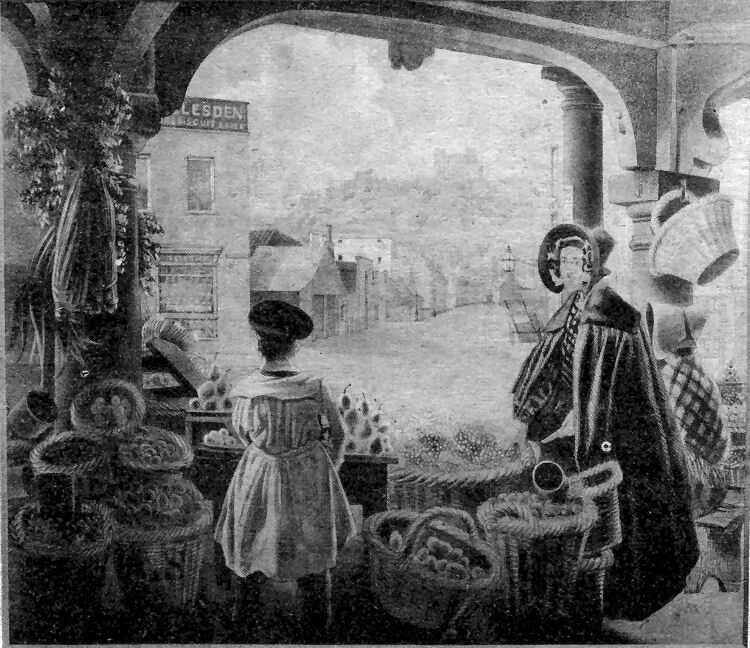 A photo-copy of an old picture of the Market Square showing, through the archway, Stembrook Mill, off Castle Street. A very ancient industry carried on at Stembrook was the Dover Tannery. At the beginning of the 19th century it was owned by Mr. Humphrey Humphrey. 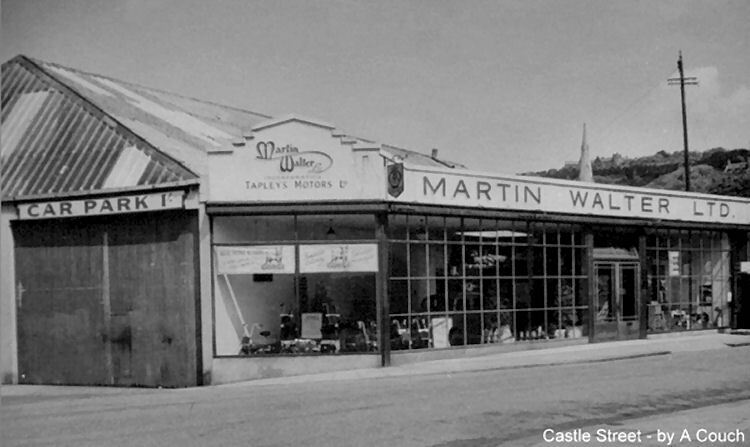 In the year 1830, his tannery was on the north side of the Dour, and he had a meadow on the south side, where Castle Street now is. Mr. Humphrey Humphrey, soon after selling that part of his property to the syndicate who formed Castle Street, left Dover, and he was shortly after elected mayor of Buckingham. He, however, left a son in Dover, also named Humphrey Humphrey, who continued to carry on the tannery until it was acquired by Mr. W. R. Mummery, from Deal, a keen businessman, who introduced into the works many improvements in method and machinery. He died in 1868, and the tannery was afterwards carried on by his two sons, Mr. William Gange Mummery and Mr. A. P. Mummery. The latter, who was a great mountaineer, and wrote “My Climbs in the Alps and Caucasus,“ lost his life, in 1894, whilst attempting to climb one of the highest peaks of the Himalayas; and on the death of the former, which occurred at Maison Dieu House, the business was acquired, in 1899, by Mr. G. A. Bacon, who imparted new life to an old established local industry, but with 20th century methods and conditions, the tannery was closed in 1922. 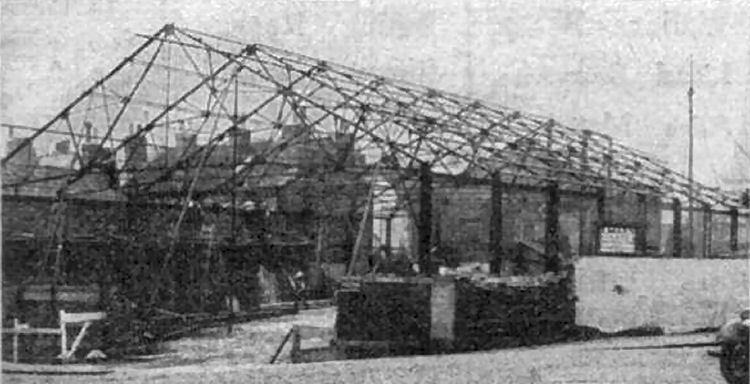 Above photo, 1936, showing the new Castle Street garage being erected, on the site of the old Tanyard and Stembrook Mill. Above photo 1948, showing the area where the Tanyard and Stembrook Mill used to stand. THAT old bit of Dover called Caroline Place, in honour of Queen Caroline, about whom popular feeling ran, so high in the early portion of the 19th Century, was once very well known to frequenters of Dover Market. Here, until 1906, was the “Old Fountain Inn,“ a house of call far the owners of market vans, which used, this street as a standing place. This house bore this name as early as 1840. Although Caroline Place was apparently a cul de sac, the extension at right angles contained a row of houses that led to the former tanyard, and the name Caroline Place was given when these were built. At the eastward end from which the extension branched off, was a block of buildings that was used as an Artillery Volunteers’ Institute before the East Cliff Drill Shed was built; it was here that Mr. Thomas Blackman started one of his earliest philanthropic works, in the formation of the Dover Youths' Institute; and at a later date, in a tentative way, he opened a Seaside Rest for London Orphan Homes, which he continued on a more extended scale in other parts of the town, from which noble effort developed his Gordon Boys’ Orphanage in St. James’s Street. When the Good Templar movement started in Dover, under the auspices of the late Rev. Hugh Price Hughes, in 1872, the Lodges took possession of the large hall of these premises after the original meeting place in Biggin Street became too small for them; and the business of the Dover Benevolent Society “for the distribution of fuel to the poor during the winter“ was conducted there for many years. From Caroline Place the terrace leading to Dieu Stone Lane, called Church Place, was built about the year 1840. Dieu Stone Lane, leading from Church Place to Maison Dieu Road, is a narrow thoroughfare for pedestrians; it is a very ancient right of way, which formed the boundary between the Maison Dieu lands and the town. On the south side, Elsam’s Cottages and Church Court were built about a century ago by Richard Elsam, who also re-built the Borough Prison in the Market Place after it was wrecked by the smugglers in May, 1820. The site of the large building on the north side of the lane was never a part of the Maison Dieu property, the town wall from Biggin Gate having passed in its rear, turning at an angle southward lower down. When the wool combers ceased to work independently in Woolcomber Street, a wool factory was established here. When the construction of the Canterbury and Dover Railway was in progress it was used as a lodging house for the navvies who cut the tunnels and cuttings near Dover, as is indicated by a still existing sign, “Excavators’ Arms Model Lodging House,“ and as late as 1861 the premises were licensed. The building subsequently became Messrs. Flashman’s cabinet-making workshop, although the middle floor for many years was known as the Union Hall, where united religious meetings were held, and for a good many years the Dover Young Men’s Christian Association was held there, under the presidency of the late Mr. W. R. Mowll, J.P., who died in 1886. The Union Hall has since 1889 been transferred to Ladywell, and the whole of the Dieu Stone Lane building is now devoted to Messrs. Flashman and Co.’s business. The name Dieu Stone Lane has only became familiar in recent years; it may have been the original name of this walk, but for many years the path was called Dee Stone Lane, from the fact that there used to be a boundary stone there with a “D“ upon it. Although, this is an old path, it may have been made since the demolition of the town wall, as there was no postern at this point. Dolphin Lane and its offshoots brings us into connection with interesting sections of old Dover. This lane is the oldest thoroughfare leading from the centre of the town to the Castle. It is now very narrow, and probably always was so, because, when it was the sole approach from the eastward, vehicular traffic was unknown. Even the town wall itself was built at a later date than Dolphin Lane was dedicated to public use.